We’re pleased to have Alison Roberts with us today. She’s here to tell us about her writing process and her November 2018 release, which is the first book in the new Hope Children’s Hospital mini-series. I’m more than happy to talk about my writing process because I love to hear about the process that other authors have. We’re all so different! Sometimes it’s a bit of a thrill – like when I read that Stephen King (like me) writes longhand. Then again, it can be daunting, like reading that Colleen McCullough (unlike me) could write 15,000 words in an evening. I’d be delighted with myself if I wrote that many words in a week! I have to say that my process is changing as the years go by, however. I’ve written more than ninety books now and while the first seventy or so were written completely longhand, being typed up chapter by chapter as a second draft and always printed out, these days I’m a lot closer to being paperless. I still do my planning on paper and usually write chapter notes but I write my story directly on screen most of the time and I don’t print out my manuscripts. In the early days, I was also a plotter and would map out a story meticulously before I began. Sometimes now, though, I dive right in with no more than a vague idea of what’s going to happen and keep my fingers crossed as I go – I’m morphing into a pantser. One thing that hasn’t changed, however, is that my process is very linear. I need to be happy with what I’ve done before I can move forward and my only attempt at writing scenes that I hadn’t got to yet was a disaster – I ended up with a final chapter that was virtually irrelevant to the story. For possibly similar reasons, I don’t seem to be able to work on more than one project at the same time although I envy those authors who can. I’ve also learned to go back to basics if the going gets tough. I’ll write out a plan. I will also revert to writing longhand because I really believe that there’s a connection between the brain and hand and what appears on paper via a pen that gets lost with a keyboard. And, on the subject of it getting tough, I think that what people refer to as “writer’s block” is a sign that subconsciously you know that something isn’t working. To allow it to stop you writing is a luxury that can only be afforded by people who don’t have a deadline. I don’t like distractions. I don’t listen to music and I prefer to have the house to myself, unless I’m sharing with a writer friend who’s also working. That’s awesome! I’ve never used an office, although I’ve created them in my homes. One even had a gorgeous antique desk and a chaise longue. No. For many years, I wrote sitting at a kitchen table. Now, I like writing in bed first thing in the morning. Or curled up on a couch. Or sitting in my car. I have to write in the mornings. If I do, I can write more in the afternoon if I have a deadline approaching. If I don’t, it’s very unlikely to happen all day. My goal is at least 1000 words a day. Every single day. Taking a break never works for me. It’s like exercise or a diet – it’s far easier to stick to a routine, even when you have days when it’s a lot harder, than it is to stop and then have to start again. Their Newborn Baby Gift, your November 2018 Harlequin Medical Romance title, will be the first book in the new Hope Children’s Hospital series. Can you tell us a little bit about the book and the mini-series? The Hope Children’s Hospital series (coming your way very soon) is a boutique Christmas Continuity with only four authors involved. 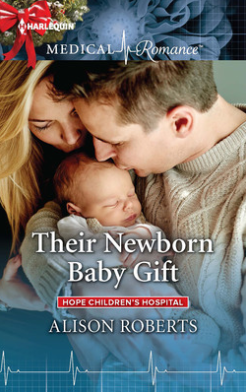 My story, Their Newborn Baby Gift, is the first of the four. It was an honour to be invited to open this continuity because there’s a real responsibility, not only in setting up the world for the following stories but making sure that my story captures readers’ hearts enough to make them want to stay in that world. I loved writing my book. With its lovely setting of Cambridge, a charming Australian surgeon hero, an abandoned baby and Christmas on the way, what’s not to love? 🙂 And I’m really looking forward to reading the other books in this series, too. In your own words, can you describe what defines Harlequin Medical Romance? What could I add to that? Well, I think that part of the attraction in both reading and writing stories set in the medical world is that they touch us in ways that are easy to relate to which is probably why I was inspired to write them in the first place. They are about events and people that could be in our local hospital or general practice. They’re real, and their emotions are real – whether they are caused by professional or personal circumstances – and that’s one of the best things about a medical romance. All those emotions like joy and sorrow and fear and triumph and love and loss can come from both internal and external factors and, in a medical situation, they can be tangled up in all sorts of ways and become even more powerful. My advice to anyone who wants to write is to just do it. I’m not saying it’s easy. In fact, I’ve always told people that I think the hardest thing to do is to pick up the pen in the first place – or get your hands on that keyboard. Not just for the first time but every time after that, too. It’s a wonderful thing, to let your imagination run wild and dream up stories, but it’s something else entirely to be able to capture what’s happening in your head and get it onto paper in a form that will allow others to see what you can see. Or, more importantly, to feel what you can feel, because I think the plot of a story is less important than the emotional journey it takes you on. You will never be a writer if it stays in your head so just do it and start getting words down on paper. As someone wise once said, you can edit anything except a blank page. And maybe your story is one that I will find it impossible to put down at some point in the future so I look forward to reading it. 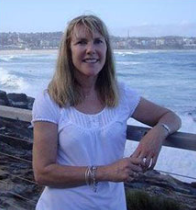 New Zealander Alison Roberts has written more than eighty romance novels for Harlequin Mills and Boon. She has also worked as a primary school teacher, a cardiology research technician and a paramedic. Currently, she is living her dream of living – and writing – in a gorgeous village in the south of France. I love reading what you wrote. As I read the article, I feel more inspired than before. Thank you.